Everyone from the youngest exercisers to the oldest can benefit from balance training exercises. All functional movements require a working balance system, from getting up out of your chair to walking to dancing to sprinting and everything in between. Good balance prevents injury, improves athletic performance, and eases activities of daily life as you go about your day. Balance exercises are especially important for senior citizens, who sadly experience a high rate of injury and fatality due to declining physical systems, including the balance system. If you’re not yet a senior yourself but you have stumbled upon this article, think of your loved ones who may benefit from this information and email this article to them or share on Facebook. Keep reading to learn why balance exercises are especially important for seniors, as well as how the physiology of balance works in seniors, the biological, behavioral, and environmental aspects of balance in seniors, and effective exercises seniors can do to improve their balance. Before beginning this or any exercise program, be sure to clear it with your doctor. Every year, one in three seniors ages 65 and over experience a fall. Twenty to thirty percent of these falls result in serious injuries, such as lacerations, fractures, and traumatic brain injuries. Even worse, falls are the leading cause of injury-related death in senior citizens. The good news is that many of these falls can be prevented through physical activity, including strength training, cardiovascular exercise, and especially balance training. Although declining balance in seniors is partially based in unavoidable biological changes, behavioral factors and environmental factors are just as important, and this is where balance training exercises and mindfulness of balance issues come in to make a big difference. The decline of balance in seniors can be looked at as a downward spiral. The first fall or just the decline of stability can lead to a fear of falling. We begin to limit our activities due to this new fear. Decreased physical activity then leads to decreased fitness levels in the areas of strength, endurance, flexibility, and balance, compounding the battle against time and gravity. Thus, the risk of falling is actually increased when we begin to limit our activity level due to our fear of falling. Don’t fall prey to the downward spiral of declining balance ability; staying active to maintain your physical fitness is the best way to prevent falls. When you consider how many of the above scenarios you encounter every day, perhaps it will give you a new appreciation for the importance of balance and a renewed desire to maintain and improve your balance system! Three sensory systems must work together to anticipate and respond to challenges to balance. These are the visual system, the vestibular system, and the somatosensory system. If any of these three systems are limited, reaction time and movement quality will be affected. The visual system refers to your sense of sight. Age-related changes in vision may decrease inputs from this sensory system. The vestibular system refers to the inner ear, which gives tells us whether it’s us that’s moving, or the world around us that is moving. The somatosensory system refers to our sense of touch, vibration, pain, etc., resulting from mechanical pressure of some sort on the body. The somatosensory system gives us spatial information about where in space our body parts are located at the current moment. Joint receptors inside the joints themselves also give us information about our body position. The somatosensory system can be trained to become more sensitive to inputs, as well as more effective at communicating outputs that in turn translate to appropriate movements. The speed and accuracy of movements generated by the movement system depend to a large degree on the quality of inputs from the somatosensory system. This is where balance training exercises make a big difference. Aging-related changes present very real health and safety hazards. Some of these factors can be controlled, others can be minimized, and some are inevitable. You have more control than you may think you have over factors affecting your balance. Vision may decline with age, affecting clarity, contrast, depth perception, and peripheral vision. Hearing may decline, possible affecting the vestibular system in the inner ear. Arthritis affects the quality of sensory input from the somatosensory system. Some seniors unfortunately experience chronic conditions such as Parkinson’s and MS which place further limitations on the balance systems. All of this makes it especially important to focus on fitness, which optimizes input from the somatosensory system, helping to compensate for the more inevitable aspects of aging. While strength, power, and endurance decline as part of the aging process, this can be counteracted through physical activity. 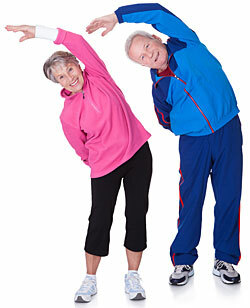 Key activities include strength training, cardiovascular training, flexibility exercises, and balance exercises. Make exercise more fun by adding group fitness classes such as Zumba Gold to your exercise schedule. You’ll have a great time while getting fit and healthy and meeting new people. 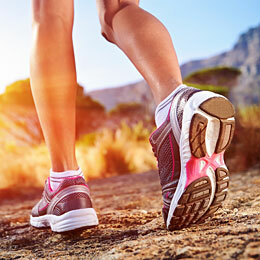 Activity versus inactivity: Stay active to maintain and improve your fitness. As mentioned above, use an integrated fitness program including components strength training, cardio conditioning, flexibility training, and balance exercises. Proper nutrition: Learn about nutrition and eat a healthy diet. There is some evidence to support the use of certain supplements, such as Vitamin D3, for helping to maintain the balance system. Footwear: Wear shoes that support your feet without being cumbersome and restrictive. Some experts advocate wearing minimalist footwear that mimic the experience of being barefoot while still protecting the foot. Bare feet are in better contact with the ground, allowing for higher-quality somatosensory input. Walk around barefoot as much as possible. Avoid excessive wearing of slippers and flip flops, and discard high heels altogether, as they are the culprit for some serious posture issues. Medications: Medication side effects can vary from person to person. Be mindful of the effects various medications may have on your balance. Ask your doctor about possible side effects of your meds. Click here for a list of environmental and other safety tips from the Centers for Disease Control and Prevention. Remember to check with your doctor before beginning this or any exercise program! Add these balance exercises for seniors to your daily routine to maintain and improve your balance. These exercises are great for seniors, but are also beneficial for folks of any age looking to improve balance, posture, and alignment! Perform these exercises barefoot for maximum sensory input through your feet and ankles. Keep a sturdy chair or something else stable next to you if you have known balance issues. If need be, you can hang onto the sturdy object for balance until your balance improves. Other than a sturdy object to hang on to, these exercises require no equipment, making them easy to perform every day at home. Just make sure you have a clear area with no obstacles and no changes in surface (such as wood floor to carpet) in which to perform your exercises. These balance exercises for seniors include suggestions for progressing the exercise in difficulty toward the end of the description. The rule is to never progress until you have perfected the basic movement. Once the basic movement becomes easy to perform with optimal posture, try the suggestions for progressing the exercise’s difficulty. The exercises begin with posture. Posture is the basis for all movements, and poor posture can be the hidden cause of pain and injury. Make sure to focus on your posture and bodily alignment throughout the day. Stand with your back against a wall and take stock of your body position. Common postural misalignments include head forward off the wall, shoulders and upper back excessively rounded, tilted pelvis, and overly bent knees. Try to straighten out so that your points of contact with the wall are the back of your head, your shoulders, your rear end, and the backs of your feet. Lengthen through the spine and stand straight. From the side, you should have an invisible “racing stripe” running down your body: ear, shoulder, hip, knee, and ankle should all be in vertical alignment. Breathing deeply, hold this position with closed eyes for at least 30 seconds, sensing and feeling your body position. As you open your eyes and step away from the wall, maintain this ideal posture. Check in at the wall at various points throughout the day. With time, your posture should naturally improve as your ability to sense and feel your body position becomes more refined. Start with optimal posture and alignment established during the Align at the Wall exercise. Lean slightly forward at the ankles, keeping the rest of the body aligned. Keep the feet grounded and active. Lean slightly back at the ankles to challenge your balance in the opposite direction. Lean in this way from side to side as well without letting your alignment change. Then, go in a circle through all four directions several times. Stance options for this move in order of their difficulty include feet hip width apart, a split stance with one foot staggered in front of the other, and finally standing on one leg at a time. Watch the following video to see a demonstration of the single leg version of this movement. You will see that the lean is a pretty subtle shift; it doesn’t need to be big. Remember to master the basic movement with both feet on the floor before progressing in difficulty! This exercise is quite simple. Starting with ideal posture, raise one knee at a time to a 90 degree angle. Turn your head from side to side and/or add upper body movements as you march to increase the challenge. Upper body movements can include reaching up with the opposite arm, reaching to the sides with both arms, or reaching straight up with both arms. With feet hip width apart, reach out one leg and tap the floor in front of you. Return to center, then reach out the side with the same leg and tap. Return to center once again, and then reach out backward with the same leg and tap. Repeat several times for each leg. This movement can be progressed in difficulty by making the taps one continuous half-circle instead of returning to center after each tap. You can also further challenge your balance by hovering the foot above the floor throughout the exercise instead of touching down. The following video shows a great demonstration of the foot-hover progression of this exercise. To perform this movement, step out sideways with one foot, then close the other foot to meet it. Repeat several times travelling in one direction, then switch directions. If you struggle to balance, perform this exercise in front of a wall so you can touch forward with your hands if necessary. Increase the difficulty by turning the head from side to side as you travel, then by shuffling faster. Establish ideal posture, and then begin to walk forward, placing one foot directly in front of the other as if you’re on a tightrope. Once you are very comfortable with the basic movement, try going backward. You can also try moving your head from side to side, or moving with eyes closed. If you are at the gym, you can try this exercise on a half foam roll or balance board. Arrange a series of obstacles such as cones or other small markers in a straight line about four feet apart. If you don’t have cones, you can simply use coins or other small household objects. Starting at one end of the course, weave through the obstacles in an “S” pattern without touching them. Difficulty can be progressed by decreasing the distance between the obstacles. This is also a great exercise for strengthening the feet and lower legs. Simply walk on tiptoes for several steps before switching to walking on your heels for several steps. Then switch from toe walking to heel walking every step or so. Increase the difficulty by closing your eyes or turning your head from side to side as you walk. Once you have mastered all of the exercises above, you can increase the difficulty of the sequence by singing or reading aloud while you do your exercises. You can also toss a ball back and forth with a partner as you go through the sequence. These activities increase the sensory inputs as well as the cognitive and motor demands of the exercises, mimicking the distractions of day-to-day life. Remember that while some aging-related changes are inevitable, you have more control over your body and your life than you might think. Staying active is one of the very best things you can do for yourself at any phase of your life, and especially as you age. To find many more articles about healthy aging, click here to visit our healthy aging category. You can also find a ton of videos showing balance exercise sequences for seniors by visiting Youtube.com and typing in “balance exercises for seniors”. 1. Centers for Disease Control and Prevention. (2012). Falls among older adults: An overview.